Werner von Wallenrod's Humble, Little Hip-Hop Blog: My Afro Should've Been On Fire In '93! My Afro Should've Been On Fire In '93! When I first heard of The Outlaw Posse's lost album finally getting released, my first thought was: I don't even know who these guys were! But then I realized this is the original name of the duo Brothers Like Outlaw, who were out on Gee Street in the early 90s. They were a UK group who never really broke into the US market, so even still I didn't know 'em too well. But I at least remembered their video for "Trapped Into Darkness" and having one or two of their older songs, which I recall being fairly well produced, on a compilation album from back in the day. So yeah, their story in short is that it's two guys: MC Bello B and producer K-Gee (not actual brothers). They had a couple 12"s first, but their debut album was My Afro's On Fire!, which I don't think was ever released stateside. Their second and last album, The Oneness Of II Minds In Unison, at least made it into US stores. But it was one of those tapes you'd see on the shelf and just leave there because you didn't really know who they were. So anyway, they broke up after that, K-Gee went on to produce for other artists (like Me Phi Me and K7, then later expanding out of Hip-Hop to guys like All Saints, George Michael and Rod Stewart) and Bello was that guy who rapped on The KLF's techno hit "What Time Is Love." Well, they had one last, third album together, which they'd recorded back in 1993; but Gee Street never put it out. So in 2018, they released My Afro's On Fire Vol. 2 digitally, and even pressed up a 7" single of two of the tracks. And now in 2019, they're finally making the whole LP available on wax (including those two songs from last year's 7") via Hip Hop Be Bop, that label who's been putting out those Silver Fox and Sugar Bear singles. It's available on black, white (white) or orange vinyl, all in a slick picture cover with stickers; or on a CD, which includes a bonus track called "Funk It Up." So, if you're not already a fan, you might be looking at the above credits I listed and thinking, Me Phi Me, K7, The KLF... not the most alluring track record. I mean, Me Phi Me actually wasn't so bad; he just needed to ditch that twangy acoustic guitar. And K7 had some interesting production... But you know what I mean. You don't want to hear an album by the "What Time Is Love" rapper, right? But this is doesn't sound like all that. It doesn't even sound like the Brothers Like Outlaw album; it's better. It's almost hard to reconcile that these are the same dudes. A couple songs, like "Ghetto Child," sound like the kind of stuff they were doing for Gee Street at the time. And that's not a criticism; it's got some creative, smooth but jazzy production with samples you won't recognize right away. But most of the album sounds like some Hip-Hop purist stuff that I never would've expected from these guys in '93. Although, now with the power of hindsight and google, I realize it does match up more with their first UK album, that was more on that tighter tip. 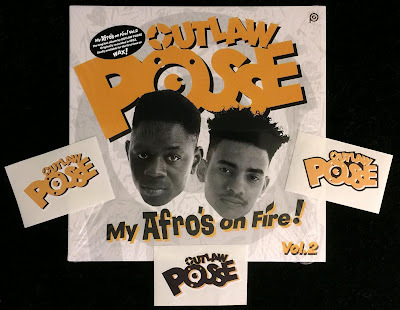 So it makes perfect sense they've called this My Afro's On Fire Vol. 2. The production does outshine the vocals a little bit. The only criticism you could give the poor true school sounding material here is that you will recognize a ton of the samples. The only "Yeah Ha Ha" uses the same funky bassline as Kid 'N Play's "Bounce," though had this album come out when it was supposed to, they would've beaten them to that punch. "In Trouble" sounds fantastic, but no better than all the other Hip-Hop records that looped up "Nautilus" the same way, like DJ Jazzy Jeff and the Fresh Prince's "Jazzy's Groove," Lord Shafiyq's "My Mic Is On Fire," PRT's "Word Is Bond" or even Soul II Soul's "Jazzie's Groove." But usually, when you've heard the samples, you haven't heard them like this. "Hey Mr Officer" uses CMW's classic "This Is Compton" piano roll and drums, but transforms it by adding very different musical elements. "Ready 4 Action"uses the same Marvin Gaye loop from Scarface's classic "A Minute To Pray," and many others, but here he turns it into a high energy with some upbeat horns and really fresh cuts. In fact, K-Gee's slick incorporation of the turntables may be this album's secret weapon. The MCing on the other hand won't threaten anybody's Top 5. But don't get it twisted; if you've only heard him on "What Time Is Love," he definitely sounds more nimble here than that. He has a healthy versatility that's able to leave the clunkiness of that song behind and adapt to a variety of tracks, be it playful freestyles or substantive songs with a message. At his worst, he's a little stiff, but still able to slip into some earnest feeling and nuance into his delivery. On "Enforce the Positive," he slips into a style reminiscent of Master Ace's "I Got Ta," but then on "Freestyle Poetry" he's surprisingly able to step up to the plate and live up to skill flexing style of the time. It helps that there are no skits or filler here. And we're not being overrun with a pack of guests. "Freestyle Poetry" features MCM from Caveman, and that's it. It's just ten solid, well produced songs that probably would've garnered them some new fans if this had managed to come out when it was supposed to. So it's nice to get this now, but I'm kind of bummed to've miss the chance to catch this material naturally when it was supposed to have come out. I'm sure it would've inspired me to go on the hunt for Vol. 1 ...which, remember, wouldn't've been easy in the US before the internet. The War On Vanilla Ice!